Save time and money with the most advanced tire registration solution. With the passing of the FAST Act, tire shops will be taking on a bigger burden when it comes to registering tires. We built Tire Registration Plus to provide shops with an easy to use tool to help them comply with federal regulations. Register every tire you sell electronically with our efficient and affordable solution. Get real-time tire recall and aging warnings. Fix the problem before it's too late. Easily view your registration history to see if you have customers affected by recalls. Tire registration and recall recovery are important safety measures to make our roads safer. Learn more about how registering tires can help save lives. The most common registration method in the market is paper postcards. There is no oversight to this process, leading to large error rates. According to the NTSB, most recalled tires remain in service or unreported to NHTSA. This is due to a flaws and outdated tire registration and recall system. According to the NHTSA Fatality Analysis Reporting System (FARS), there were nearly 500 fatalities in 2017 alone, attributed to tire blowouts or flat tires. Tiremetrix created an easy to use tire registration platform that delivers real benefits for my business and my customers. Now, every tire is checked for accuracy, age and recall status before the customer leaves the shop. When we entered the DOT number in Tire Registration Plus it alerted us that the tire was subject to recall. We were able to contact the customer to take care of it immediately. Made us look great! Thanks Tiremetrix. 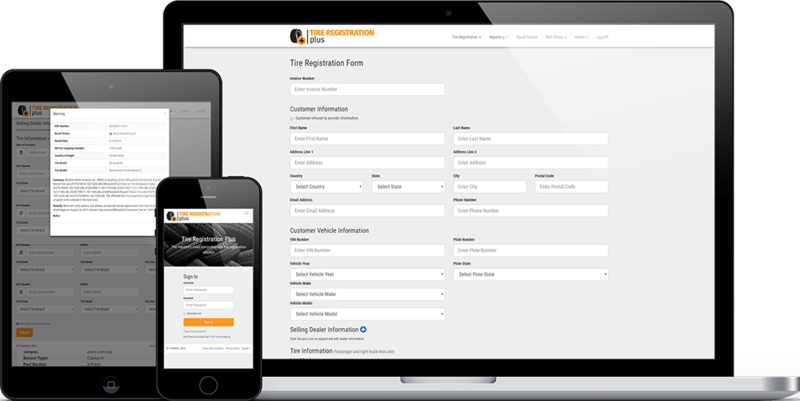 Tire Registration Plus is integrated directly into the industry's top shop management platforms. Check out some of our partners below.